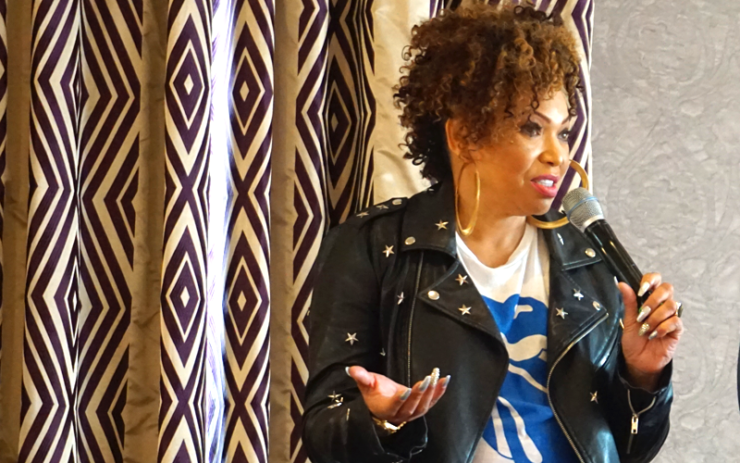 "If you don’t wait on line for the club, don’t wait on line for your career," said Tisha Campbell-Martin to promising actors in New Orleans on Saturday. Cambell-Martin visited the city in support of building the Magi Performing Arts Centre, and to boot, she hosted an Actor's Seminar. But being attuned to the ebbs and flows of Hollywood, Campbell-Martin, as she stated, “postulated” on the Regina King-directed, police drama, “The Finest” for the upcoming season. Campbell-Martin told a room of budding actors in New Orleans Saturday that she categorically wanted this job due to historical precedence. She said, “we have three black women [Regina King, Reina King, Robin Roberts] who wrote a show, a true story about five African-American women who are high ranking police officers in Queens.” For Campbell-Martin, who had received seven scripts this pilot season, she believed “The Finest” was her opportunity to serve her people. “An artist is a person who is a communicator of God’s word,” Campbell-Martin put forth. This was hers. She needed it to sustain her passion. Campbell-Martin successfully landed the gig and went to New York City to shoot the story of five African-American sisters on the NYPD. Campbell-Martin’s service extends to her family, especially raising two black boys, seventeen and nine years old. Concerned that her oldest son, Xen, who was diagnosed with autism could quickly become a target of police aggression, she asked her brother Stan Campbell to teach him how to respond to police encounters. Afterall, Campbell is a retired police lieutenant from Oklahoma City who spent over fifteen years teaching police officers and citizens in police tactics, self-defense and of course de-escalation. Training of his nephew went so well, coupled with the shooting of Charles Kinsey an autistic man in the middle of the street in North Miami, that the Campbell siblings started a new movement, D.O.P.E. (De-escalating Officer Patrol Encounters). According to Stan Campbell, “we are losing good people on both sides, so we don’t subscribe to #blacklivesmatter or #bluelivesmatter, but #toetagsmatter.” The first offering from the D.O.P.E. movement is a boot camp for you men with autism called Spectrum Shield, where they are put in high pressured situations with real officers. Satisfied customers include Rodney Pete and Holly Robinson Pete, whose son R.J. is on the autism spectrum and took the training live on, “For Pete’s Sake,” their reality show on OWN. The selfless Campbell-Martin was in New Orleans to share these stories and encourage young actors to take a holistic approach to their chosen careers. “We teach. We harness human emotions so that we can utilize our platforms to make our lives better and our communities better. That’s the difference between an artist and a celebrity,” she told them. Campbell-Martin’s ultimate goal this trip to the Crescent City was to, not only, build up young actors through hands-on training and a lecture, but create awareness and generate support for the multi-million dollar Magi Performing Arts Centre in the city’s 7th Ward. “I hope that we can get this building done very very soon. It’s not going to only be actors, but there’s going to be musicians, culinary arts, it’s for all of the arts and how important it is,” Campbell-Martin declared. Her journey started at the age of five when Campbell-Martin realized she could help people. She entered a talent contest pointedly to win the color television, which was the 2nd prize. That didn’t go as planned. She won the 1st prize of a car. A whole car. Looking over and seeing her parents shedding tears of joy, the young Tisha realized what had just happened and thought, “Ooh, I can help my family. I can make people cry, laugh, I can touch their hearts, I can make them recall and remember, I can make them reminisce, I can make them love, I can make them think, I can make them change their mindsets.” It was that moment Campbell decided how she would spend the rest of her life.